Arthritis is very serious and affects many people. There are some natural things that can help. 1. Good Nutrition. Eat lots of fruits and vegetables (except nightshades), drink clean water and eat natural pasture-raised meats. Avoid refined sugar, processed dairy products, chemical preservatives and especially foods cooked with or containing hydrogenated oils. 2. Avoid Nightshades. Nightshades include tomatoes, potatoes, peppers and eggplant. Other food members of the nightshade family include: sweet and hot peppers (including paprika, cayenne pepper and Tabasco sauce); ground cherries; tomatillos and tamarillos; garden huckleberry and naranjillas; pepinos and pimentos. The effect of foods on arthritis symptoms vary greatly from person to person. It is an individual decision whether or not to avoid nightshade vegetables. Surprised? It's not easy because these plants are in most meals. 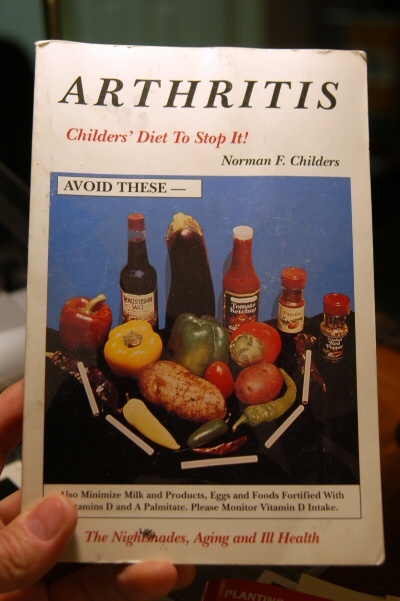 Read the book Arthritis - Childer's Diet to Stop It! by Norman F. Childers. 3. Stop Smoking. Too bad I even have to mention this. Tobacco is also a nightshade. 4. Use Vinegar. As you probably know, I have been recommending vinegar for a long time for several uses. In addition to the horticulture and agriculture uses, there seems to be some important health benefits for animals and people. Apple cider vinegar might cure more ailments than any other folk remedy. Vinegar apparently provides at least some cures for allergies (including pet, food and environmental), sinus infections, acne, high cholesterol, flu, chronic fatigue, Candida, acid reflux, sore throats, contact dermatitis, arthritis, gout and the list goes on. Apple cider vinegar also helps breaks down fat and is widely used to lose weight. It has also been reported that a daily dose of apple cider vinegar either straight or in water helps control high blood pressure. It also brings a healthy, rosy glow to the complexion and can cure rough scaly skin. 5. Use Herbs. Aromatherapy is an ancient Egyptian art rediscovered early in century by a French chemist named Rene-Maurice Gattefosse. It uses essential oils as lotions, which are said to penetrate the skin to heal you. Juniper oil relieves arthritis swelling, while sandalwood improves circulation. A variation on this is an herb poultice. Mash juniper or sandalwood leaves into a wet pulp and wrap them with a cloth around your sore joints. Leave on for a few minutes. 6. Home Remedy of Raisins and Gin. It tastes good even if it doesn't help lessen the pain. Soak golden raisins in just enough gin to cover the raisins. Allow the gin to evaporate, and then keep the raisins in a closed glass container. Eat nine (9) of these boozed-up raisins a day. Some say dark raisins work just as well and others say that sloe gin works better than regular gin which is made from juniper berries. Sloes are the fruit of the blackthorn bush and are actually wild plums. The flavor of the fruit is bitter, so the small plums are not good for eating, however, the effect of frost makes them milder. The bitter flavor is lost when making liqueurs.